My kids text. I text. In fact, my younger son only texts; he doesn’t talk on the phone anymore. But, some of my adult friends refuse to learn to text and my wife barely knows how and responds…usually…within a week or so. This is a problem for those parents that want to be at least slightly “in touch” with their kids. Like my friend Steve. Steve is a CPA and a good one. We were involved in a charity group and would often go to dinner with a large group and Steve would always be given the check because he’d instantaneously calculate each person’s share, to the penny. Steve has two young girls, and is a devoted dad. However, when it comes to technology, he often is resistant, to put it mildly. He has a cell-phone and a computer, but he refuses to join ANY social media outlet or to use texting, AT ALL. I love Steve, especially because he makes me feel like I’m a tech genius – ha! I’ve tried to explain to him – why he should begin texting – but he won’t listen. Okay, I’m going to try again. I’m a so-called parenting expert so here goes, Steve! DO IT FOR YOUR KIDS? Do you really want to be part of that generation that just never gets it? Like our parents? Huh, huh? Your kids are growing up with everything technological – it’s second nature to them – so YOU have to at least try to catch up so YOU can relate to them, so YOU can monitor what their doing, and frankly so YOU can not be an old fart! 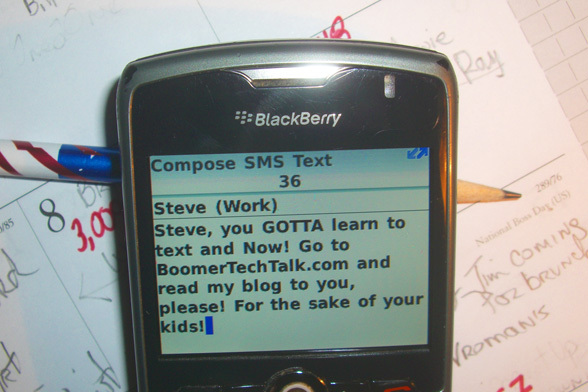 Steve, you tell me that your kids don’t even have cell-phones yet. Trust me, Steve, you and your wife will get them cell-phones and they will be texting, they will be playing games on their cell-phones, and you will still be trying to figure out auto-dial. So, Steve, I say “text, Steve, text” and learn it now!